Dr. Alfred Sommer was born in the United States. He served as the dean of the School of Hygiene & Public Health at Johns Hopkins University (USA) and professor of Epidemiology, International Health and Ophthalmology at the university. 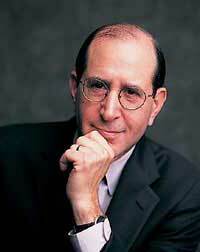 Dr. Sommer received his medical degree from Harvard Medical School, conducting his medical internship and residency at Harvard University’s Beth Israel Hospital, his fellowship in epidemiology at Johns Hopkins, and his residency and fellowship in ophthalmology at the Johns Hopkins Wilmer Eye Institute. Since 1969, Dr. Sommer and his family have traveled and lived extensively in developing countries, pursuing research related to blindness prevention and child survival. As a founding member of the International Vitamin A Consultative Group (IVACG), he has advanced global policy and programmatic initiatives for the control of micronutrient deficiencies. Dr. Sommer has authored five books and more than 250 scientific articles. He has chaired advisory committees for numerous organizations, including WHO, UNICEF and the National Institutes of Health (U.S.), and is an elected member of the U.S. National Academy of Sciences, Institute of Medicine, serving on its Food and Nutrition Board. Dr. Alfred Sommer’s contributions to our understanding of epidemiology and consequences of malnutrition are marked by innovation and persistence. The first, soon after completing his basic medical education, was the pioneering demonstration that simple anthropometrical measurements were closely associated with subsequent childhood death. These and other indices are now routinely employed in nutritional screening, measurement, and surveillance programs. Dr. Sommer’s major, long-term continuing research interest involves the cause, magnitude, consequences, and control of vitamin A deficiency and those of related micronutrients. These investigations began in earnest in the mid1970s with a complex series of intervention trials that Dr. Sommer conducted in Indonesia (1976-1980). In addition to revealing the epidemiologic characteristics and determinants of deficiency among young children, Dr. Sommer documented the complete clinical spectrum of xerophthalmia, from mild nightblindness, retinal depigmentation and corneal punctate keratopathy, through blinding keratomalacia. He uses clinical-pathologic correlations and randomized trials to demonstrate that corneal ulceration and blindness was entirely related to vitamin A deficiency. Parallel studies he organized with colleagues in Africa demonstrated that most measles-associated pediatric blindness was related to acute decompensation of vitamin A status. Dr. Sommer’s most important insight, and initially the most controversial, was his recognition that mild vitamin A deficiency dramatically increases childhood death, particularly from reduced resistance to infection diseases (primarily measles and diarrhea). It took Dr. Sommer and his team a number of largescale, community-based randomized trials, from 1983 through 1992, to finally convince the broad scientific community and major policy makers of the validity of their observations and potential impact. As a result, control of vitamin A deficiency was included in the Declaration of the Rights of Children, as well as the Plan of Action of the World Food Congress. 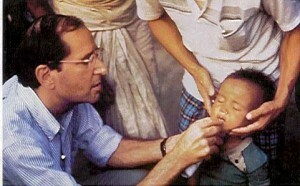 Upon discovering that vitamin A deficiency was far more common than previously recognized, Dr. Sommer’s remarkable ability to move from science to practice is marked by his demonstration that the debilitating consequences of deficiency could be effectively, and far more urgently and cheaply treated with oral high-dose vitamin A supplementation and did not require sterile injectable preparation. As a result, the World Development Report (World Bank) declared vitamin A supplementation one of the most cost-effective of all health interventions.